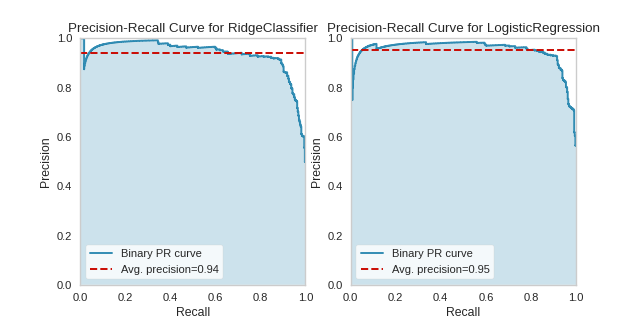 Precision-Recall curves are a metric used to evaluate a classifier’s quality, particularly when classes are very imbalanced. 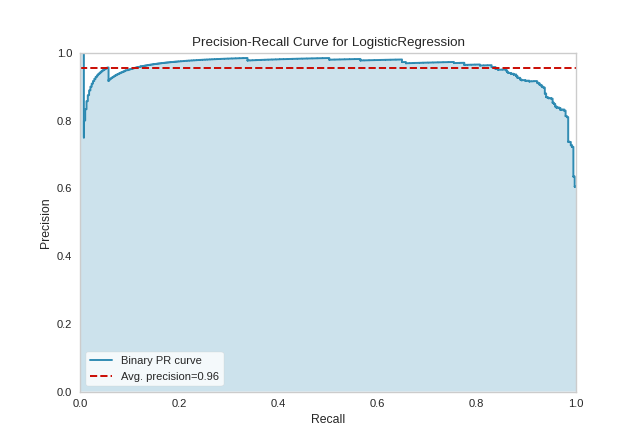 The precision-recall curve shows the tradeoff between precision, a measure of result relevancy, and recall, a measure of how many relevant results are returned. A large area under the curve represents both high recall and precision, the best case scenario for a classifier, showing a model that returns accurate results for the majority of classes it selects. The base case for precision-recall curves is the binary classification case, and this case is also the most visually interpretable. In the figure above we can see the precision plotted on the y-axis against the recall on the x-axis. The larger the filled in area, the stronger the classifier is. The red line annotates the average precision, a summary of the entire plot computed as the weighted average of precision achieved at each threshold such that the weight is the difference in recall from the previous threshold. A more complex Precision-Recall curve can be computed, however, displaying the each curve individually, along with F1-score ISO curves (e.g. that show the relationship between precision and recall for various F1 scores). Implements Precision-Recall curves for classification models. A classification model to score the precision-recall curve on. Fill the area under the curve (or curves) with the curve color. Annotate the graph with the average precision score, a summary of the plot that is computed as the weighted mean of precisions at each threshold, with the increase in recall from the previous threshold used as the weight. If multi-class classification, draw the precision-recall curve for the micro-average of all classes. In the multi-class case, either micro or per-class must be set to True. Ignored in the binary case. Draw ISO F1-Curves on the plot to show how close the precision-recall curves are to different F1 scores. 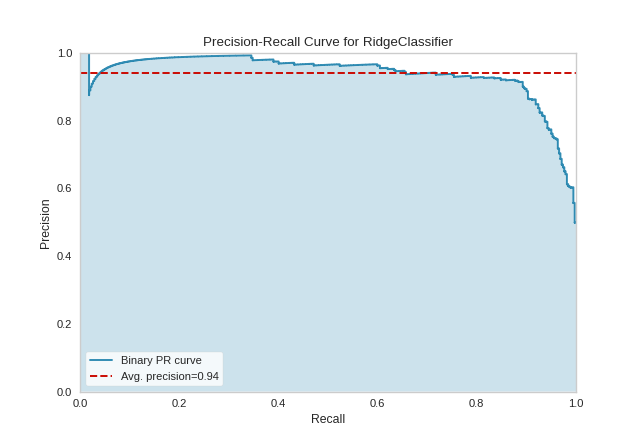 If multi-class classification, draw the precision-recall curve for each class using a OneVsRestClassifier to compute the recall on a per-class basis. In the multi-class case, either micro or per-class must be set to True. Ignored in the binary case. Specify the alpha or opacity of the fill area (0 being transparent, and 1.0 being completly opaque). Specify the alpha or opacity of the lines (0 being transparent, and 1.0 being completly opaque). Keyword arguments passed to the visualization base class. Either "binary" or "multiclass" depending on the type of target fit to the visualizer. If "multiclass" then the estimator is wrapped in a OneVsRestClassifier classification strategy. Average precision, a summary of the plot as a weighted mean of precision at each threshold, weighted by the increase in recall from the previous threshold. In the multiclass case, a mapping of class/metric to the average precision score. Precision values such that element i is the precision of predictions with score >= thresholds[i] and the last element is 1. In the multiclass case, a mapping of class/metric to precision array. Decreasing recall values such that element i is the recall of predictions with score >= thresholds[i] and the last element is 0. In the multiclass case, a mapping of class/metric to recall array. Draws the precision-recall curves computed in score on the axes. Finalize the figure by adding titles, labels, and limits. Fit the classification model; if y is multi-class, then the estimator is adapted with a OneVsRestClassifier strategy, otherwise the estimator is fit directly. Generates the Precision-Recall curve on the specified test data. Average precision, a summary of the plot as a weighted mean of precision at each threshold, weighted by the increase in recall from the previous threshold.